Hill's Prescription Diet Canine z/d is a complete hypoallergenic dog food. 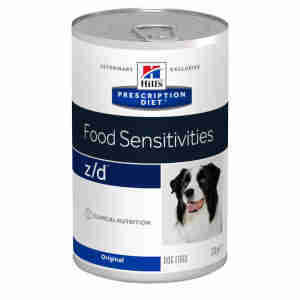 Hill's Prescription Diet Canine z/d is a dry dog food mix that helps to control your pet's allergies. Made using all natural ingredients, it limits your dog's contact with the common culprits of food intolerances.The protein in Hill's Prescription Diet Canine z/d comes from a unique hydrolysed chicken formula. Highly hydrolysed protein is broken down into smaller pieces so your pet's immune system can't detect them. Smaller pieces also make it easier for your dog to digest so they absorb the maximum amount of nutrients. This dry mix is rich in essential fatty acids that support healthy skin and a glossy coat, which can become dry and irritated with allergy. Naturally occurring antioxidants help your dog fight off illnesses when their immune system is low due to intolerance. antioxidants keep their immune system strong. It's easy to tell if your pet is suffering from an allergy. They might become lethargic, vomit or have diarrhoea. If you think your dog might have an intolerance to their food, you should take them to your vet for a full diagnosis. Hill's Prescription can replace your dog's regular food for life. Use for a trial period of three to eight weeks before switching and follow feeding guidelines for your dog's breed and weight. If they still show signs of intolerance, take them back to the vets as soon as possible. Additives per kg: Nutritional additives: E671 (Vitamin D3) 2,050IU, E1 (Iron) 367mg, E2 (Iodine) 9.7mg, E4 (Copper) 46.6mg, E5 (Manganese) 16.1mg, E6 (Zinc) 234mg, with natural antioxidant. Order easy to complete, and was promptly dispatched, arriving on schedule. Very helpful staff members. We were getting desperate, on what to feed our dog next, we had tried all the usual for a dog that has had continuous tummy troubles, plus itchy skin, and feet, our vet recommended hills z/d, and 6 weeks on we have a calmer dog, the feet biting, and constant scratching has stopped, her coat looks great, we need to find something to bulk this out with as the recommended 4 tins a day for a German Shepherd , is extremely costly, but at the moment we have a very happy pooch who cannot wait for mealtimes. Delivery was very prompt and have nothing but praise for the service we have received. Purchased the wet form of this as dried was out of stock . Really thick , pate like & after two days my dog wouldn’t eat it . So pleased with this food, since my Mitzi has been on this dog food, her tummy is better and her skin and coat has improved,my vet recommended she has it,I'm most impressed no bad tummy so far. Delivery was quick and regular notifications of delivery, the price is good too. Brilliant product, but such a shame that it is continuously out of stock.